Philadelphia 76ers guard Jimmy Butler (23) talks with an official during the second quarter against the Orlando Magic at Wells Fargo Center. It was the Ben Simmons and Tobias Harris show for a lot of Tuesday night's game against the Orlando Magic. But when winning time arrived, the ball was put in the hands of Jimmy Butler, and he put the finishing touches on a 114-106 victory for the Sixers. As always, it was a little too close for comfort, but with the Sixers down three centers before the game even started, it's a bit more understandable than some of their other crunch-time adventures. Here's what I saw on Tuesday night. 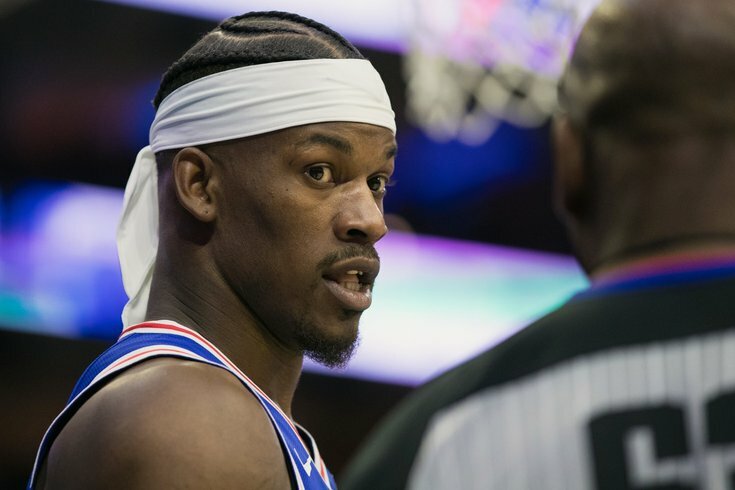 • Big fan of the samurai headband, so kudos to Jimmy Butler for leaning into the look. • Once the Sixers learned Jonah Bolden would be out for Tuesday night's game, they had to figure out a Plan B (really, more like a Plan C or D) for defense against Nikola Vucevic. Do you try to put somebody on the floor who can match up with him best in one-on-one situations, or play smaller and force him to defend in space? The Sixers mixed both in well, with the latter strategy working best in this writer's opinion. Vucevic is the sort of guy who is going to get his pretty much no matter what, so you might as well exploit his weaknesses on the defensive end. By playing a sleeker lineup built around Ben Simmons and Mike Scott in the frontcourt, the Sixers forced Vucevic to play defense out to the perimeter and roasted him. We often see teams use this sort of strategy against the Sixers to the frustration of most people at the Wells Fargo Center, so it's about time they turned the tables on teams more regularly. And to his credit, Amir Johnson did a good job of bothering Vucevic when he was on the floor. Say what you will about Johnson at this point in his career — the guy is not going to do much defending in space — but he's still going to battle and make other centers work if they go at him in the post. Not someone you want to see in anything more than a cameo appearance usually, but he got the job done on Tuesday. • A little kid at the game had a T-shirt go through his hands during an intermission, only for Elton Brand to scoop it up and toss it to him. Instead of keeping it for himself, the little guy turned to a pair of women down the row who were probably at least 10 years older than him and offered it to them. I respect the hustle, young man. • Justin Patton played his first minutes for the Sixers on Tuesday night, and while I'm not totally sure what to make of his defense because of the nature of the game, I thought he showed some real promise on offense. That's not a surprise after watching him some in college and with the Blue Coats, but it's always nice to see things translate at the highest level. As a rim runner, Patton has always looked the part. But he was particularly excellent as a passer against Orlando, making quick reads and touch passes that are not typical of big men his age. He fit right into Philadelphia's style of play and helped keep the offense humming in what turned out to be a shootout against the Magic. We'll see if he holds up under further scrutiny, but he made an excellent first impression. • The chemistry between Simmons and Harris is pretty unreal when you consider that these guys have only been teammates since February. It's such a natural pairing on so many levels — Simmons is the oversized setup man who is always looking for the open man, and Harris is always hunting for gaps in the defense, regardless of where they may come. When Simmons posts up, you might see Harris serve as his outlet man on the perimeter or cut toward the rim if Simmons faces up. In transition, either guy can serve as the ballhandler or provide a big, athletic outlet for their partner. The jury is still out on whether Jimmy Butler and Joel Embiid can build a fruitful two-man partnership. But we have learned rather quickly that the Sixers should do all they can to keep Harris and Simmons' minutes intertwined. • The Sixers could have used an outbreak in a more tight-knit affair, like their loss to the Warriors the other night, but they have to be thrilled to see JJ Redick get going again. Redick lit the Magic up in the first half, and though it led to some ill-advised heat checks, they'll take that any day of the week over watching their veteran shooter go ice cold. • It was quite a weird game for Jimmy Butler, who spent a lot of the first half uninvolved on offense. But he came out of the locker room like he had been the star of the first 24 minutes of play, and he was the difference for Philadelphia down the stretch. With the way the Sixers are set up now, there are going to be nights where star players have to take a backseat for long stretches of play and still come up big when it matters. Staying engaged when you're not at the center of the team is an adjustment for their star players, who have dominated touches and attention pretty much everywhere they've been. I think Butler deserves a lot of credit for staying involved in the game on Tuesday night. The shots were there for him in crunch time, but it was his activity on defense that made a bigger difference, with Butler harassing Nik Vucevic whenever he thought he had a moment to relax on the block. There have been better Butler games, but this was an important one. • On first glance, I'm not sure how much to blame the Sixers for the poor defensive showing. A lot of points were scored, but some of it comes down to Orlando just being absolutely on fire from the field. Aaron Gordon hit some preposterous stepback shots that you're going to live with every time. That being said, a few of the Sixers probably needed to read the scouting report on Orlando. They left Evan Fournier wide open on several different occasions, and he's the last guy on the Magic you want to give a clear look at the rim. Philadelphia was largely able to mask this by just outpacing Orlando on the other end, and frankly, that's not a bad strategy in this matchup. The Sixers have far better top-end talent on offense and can pull away in a shootout, as they did Tuesday. It just would have been nice to see them offer a bit more resistance, that's all. • There's a little bit of Richaun Holmes in Patton, and I don't mean that in a good way. He's going to have to learn to pick his spots as a shot blocker because chasing them got the Sixers into a bit of trouble early in the fourth quarter. It's a tough balance to strike — you don't want to play him and hemorrhage points, but you're not going to see him learn as much if he doesn't get enough reps.
• Philadelphia's fourth-quarter effort was abysmal on just about every level. They bricked wide-open jumpers, they completely lost guys in transition — I swear, Fournier really might not have made the scouting report — and finally turned it on when it mattered to get the win over the line. A nice, comfortable win would be cool every so often, fellas.